Kerrville, TX (Blugolds.com) The University of Wisconsin Eau Claire women's tennis team got a great start to their spring break trip to Texas with a pair of victories on March 26. The Blugolds defeated Sul Ross St. 9-0, and then went on to win 8-1 over Schreiner. In their 9-0 victory over Sul Ross St., all three doubles matches went in favor of the Blugolds, giving them a 3-0 lead heading into singles play. Natalie Wijesinghe (Apple Valley, MN) and Emily Cooper (White Bear, Minn.) picked up a 8-3 win at number one doubles. Hanna Zevenbergen (Baldwin,Wis./ Baldwin-Woodville) and Molly Stewart (Amery, WI) didn't miss a beat following with a 8-0 triumph at number two doubles. Lindsey Henderson (Prior Lake, Minn.) and Alexa Brooks (Beaver Dam, Wis.) paired up to finish the doubles sweep with a 8-0 win at number three doubles. In singles action, Wijesinghe was victorious at number one singles Cooper defeated Carman (SRS) 6-1, 6-1 at number two singles. Stewart won in straight sets at number three singles, Zevenbergen defeated Ramirez (SRS) 6-0, 6-1 at the number four slot. Henderson and Emma Barnd (Wells, Minn/ United South Central) both were victorious 6-0, 6-0 at the number five and six slots, respectively. Later in the day against Schreiner (TX) the Blugolds' won two of three doubles matches with Stewart and Zevenbergen picking up another victory at number two doubles and Henderson and Barnd winning 8-4 at number three doubles. 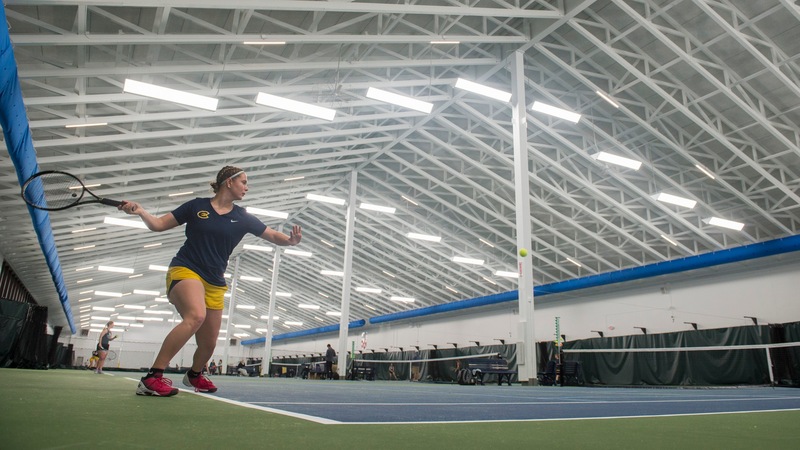 Eau Claire won all six singles matches with Wijesinghe leading the way with a 6-1, 6-2 triumph at number one singles. Cooper defeated Smith (SCH) 6-3, 6-1 at number two singles, while Stewart earned another win at the three slot. Henderson pulled off a win at the four slot and Zevenbergen and Barnd were able to finish the singles sweep with victories at the five and six slots, respectively. The Blugolds with play tomorrow at Southwestern (Tex.) at 5:00pm. Follow the Blugolds on Blugold Game Day or on the 'UWEC Blugolds' app' on your mobile device.